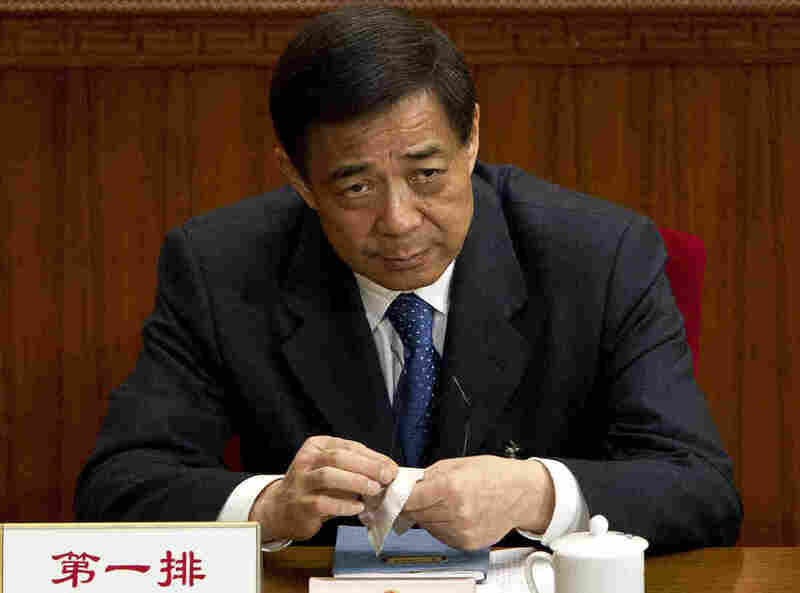 Once Prominent Politician Bo Xilai Expelled From China's Communist Party : The Two-Way His fall from grace began when a local police chief told authorities about the murder of a British businessman. Bo's wife was convicted, and he's been connected to the handling of the case and other alleged corruption. Citing "severe disciplinary violations" connected to his wife's murder of a British businessman and other allegations of corruption, the Communist Party of China today expelled once prominent politician Bo Xilai and turned him over to "judicial organs" for prosecution, the state-controlled Xinhua News Agency reports. The BBC adds that Xinhua also said that Bo "stood accused of corruption, abuse of power, bribe-taking and improper relations with women." As NPR's Frank Langfitt reported earlier this month on Morning Edition, Bo's fall from grace began when a police chief from southwestern China "hid out in the American consulate in Chengdu. ... He had a falling out, apparently, with Bo Xilai. ... And apparently when he was talking to U.S. diplomats, he told them that Bo's wife actually had killed a British businessman." The wife, Gu Kailai, was convicted in August and given a suspended death sentence for the murder of that businessman, Neil Heywood. The police chief has been given a 15-year prison sentence for "'bending the law, defection, abuse of power and bribetaking" in the Neil Heywood case, as the BBC says. Bo, The Associated Press adds, had been "a candidate for top office" until he was caught up in the scandal. On Talk of the Nation Thursday, host Neal Conan talked with former NPR correspondent Rob Gifford, now China editor of The Economist, about the scandal, China's dispute with Japan over islands in the South and East China Seas, and the upcoming transfer of power to a new president. According to Rob, China's leaders are worried that "there is a tipping point coming where it's going to actually be more dangerous for them not to start some reforms, the structural reforms. It's going to be more dangerous not to do that than it is to do that." But, he added, there is "a sort of minor paralysis in the Politburo" about just what to do. On All Things Considered later today, NPR's Louisa Lim will have more on Bo, the case against him and what it means for China's leadership. "There are signs already this could be the intended strategy. Xinhua says 'party organizations at various levels must use Bo's case as a negative example to enhance cadre education, management and supervision.' It also urges 'a resolute battle against corruption, leaving no room for corrupt figures to hide within the Party.' "
On Morning Edition, NPR's Louisa Lim told host David Greene that "it really looks like the leadership is throwing the book" at Bo. "He was one of China's top leaders," she added. "It appears that China's leadership are now taking down one of their own in a very public way. ... It's a very big deal." And it's very big deal in part, Louisa added, because now that the leaders have figured out what to do with Bo they can move on to the next party congress, which has been set for November.